You have to appreciate the fact that Vin Disel is so geeky that not only was his character named Melkor, he was a Witch hunter from the Arcanum book, but now he has a movie more or less based on his character. So what exactly is a "With Hunter"? Well I have been fairly quiet on the whole concept myself. But before that, let's talk about what has been done first. I should begin with the Witch Hunter that Vin Disel used and the one that I think of as first anyway, the Witch Hunter from the Arcanum. 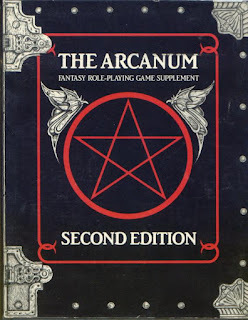 All the classes in the Arcanum and the Bard Games "Compleat" books before it were all very thin in nature. Some guidelines, some flavor, but a ton of imagination! The class is described as a dual classed hunter/mystic with "highly trained" combat abilities. They read a lot like Rangers to be honest, save with a focus on hunting down spell casting classes. They get training in two weapons (Weapon Proficiencies) and gain two more over the course of their career. They gain the skills of tracking, reading magic, stealth and spell casting. As spell casters they can't wear armor. Advancement by level is detailed later in the book (they are on the high end) and they take spells from the Mysticism list, which are similar to Clerics. (Note: I should have covered these Mystics back when I did mystics for my first Class Struggles). The witch-hunter gets a maximum of 3 attacks per round when they reach level 13 (remember this is 1st-2nd ed-ish). They also gain a +1 to hit every other level. There are hunter-like kits for 2nd ed. AD&D, but no witch-hunter really. 3rd Edition and the OGL brought out a number of various witch hunter classes. Many though not till Pathfinder came out. Super Genius Games had a bunch of books out for OGL/Pathfinder for Witch Hunters. The Genius Guide to the Witch Hunter and With a Bullet Point 9 Witch Hunter Feats. With these two there is plenty to run your witch hunter in Pathfinder. Unlike the Arcanum, this one does not use spells but instead has a number of special powers each level. Both methods are fine with me really. Not to be outdone there is the Player Paraphernalia #11 The Witch Hunter from The Knotty-Works. This class also gets good combat ability and some powers, but it also gets spells to 4th level. This puts it on par with the Ranger. It has a couple of new feats, but no new spells. Though you are getting a lot here for a buck and half. So between these three books there are even more choices. On the OSR/Retro Clone side we have only one product I know of, PC3 - The OSR Witch Hunter by Jeremy Reaban. This book has a number of nice features in addition to the class. The class does not cast spells, nor does it have a lot of special powers. This is by design and owning to the stated literary source. It does have some skills such as read magic and turn undead. What I think makes this special is the level advancement tables for "First Edition", "Original Edition", "Basic/Expert" and "Cyclopedic Edition". Nice feature if you ask me. What Should A Witch-Hunter Do? One question not always addressed is what exactly does a witch hunter do? That's for the player. The question to ask the GMs is what do Witch Hunters hunt when there are no witches (as a class) in the game? The Arcanum version tends to focus on all spell casters. The Pathfinder ones tend to focus on the witch class. Allow me to toss this one back to you all. Would you or do you use "Witch Hunters"? If so, who do they hunt? What do they do once they have one? The 5E version definitely draws on The Witcher game series as well. I believe I read the Mercer drew up it for inspiration too. My idea of Witch Hunters (like you mentioned) is Rangers that have Witches/Evil Spellcasters as their favored enemy. Nothing more, nothing less. Justin, I thought that was the case, but I know very, very little about The Witcher. Marcelo, that is what I have used in the past as well. 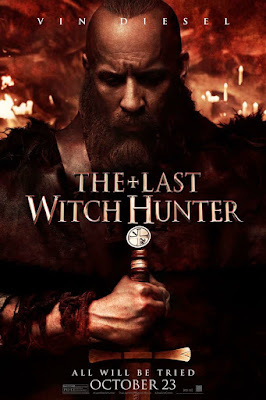 you know it's weird all the trailers and promotions have left me with no desire to see the last witchhunter which just makes me think of the inquisition scene in mel brooks history of the world. however your comment that it's basically vin diesal acting out his geek fantasy by having a movie made of his D&D character suddenly makes me want to see it. Get and read the stories in "The Last Wish", you will know all you need to of The Witcher. Good stuff. The Freeport: The City of Adventure book for Pathfinder has a Witch Hunter archetype for inquisitors. It's tied into the setting's Hexworth Inquisition, which is focused on rooting out necromancers (and will persecute anything that smells even faintly of dark magic) but the archetype can easily be adapted to other settings. I would in the right game. For instance, I've brainstormed a game dealing with a Matron, Mother, and Crone as the big bads and a game where Hags were the big bads. If I had a witch in the game, before I'd allow a witch hunter, I'd develop a melodramatic hook on why there would only be conflict if it drove the story (and hopefully have an arc where the two became friends ala Gimli and Legolas). Um...I also had a Witch Hunter in The Complete B/X Adventurer. It's one of my favorite classes in the book. I would think the class would be a good one for more "late period" D&D games (thanks to the likes of Solomon Kane, I always associate witch hunters with black powder weapons). It would make a fine replacement for the cleric class (presuming you have house rules that provide alternate methods of healing PCs) in a campaign setting where magic is feared and hated. Such characters could still party with MUs providing they shared alignments (a good wizard paired with a good WH to take down evil spell-casters, or a Chaotic WH that is a hypocrite more interested in using his authority/position to prey off the fears of the populace while simultaneously partnering with dark forces that allow him to indulge in sadistic tendencies). In a campaign that includes multiple witch or MU player characters, witch-hunters can serve as the same type of NPC antagonists that assassin guilds serve in some campaigns (hunting the PCs). I'd also think they'd be a good archetype in campaigns that feature LESS magic and more "supernatural evil" ...settings akin to LotFP...the WH's ability to detect (and hunt) evil and magic would be boons to any party. Despite the term "witch" hunter, I'm fairly against focusing the class specifically on "witches." In this case, I think the archetype title is using the word witch as a pejorative term to mean "any evil spell-caster"...and even supernatural creatures (demons and the like) whose existence in the physical world is due to "witchery" or "witch-craft" (i.e. black magic or "evil" spells). It's not really a class for your typical "loot the orc/goblin" D&D campaign...unless those goblins are some sort of demonic spawn. But it's certainly a useful class for one in which the forces of Law struggle against the tide of Chaos and Evil (in the Warhammer-style of Chaos being dimensional rifts through which pour hellish beings). In such a setting, you'll find witch hunters...some good and righteous, others corrupt charlatans. Heck, I could see a campaign in which the witch-hunter replaces both clerics AND fighters (and probably demihumans if you're doing B/X-style "race-as-class"). A fresh new party filled with young witch-hunters (and thieves and MUs) would be pretty cool...I could think of some adventures for THAT. I intend to release a Swords & Wizardry Hunter class next week for the Octhorrorfest series. I intend it to be customizable (you pic enemy type) so you could create a Witch Hunter, Vampire Hunter, Were Hunter etc. Generic bonuses to attacks and saves against the particular enemy type. I totally forgot about The Complete B/X Adventurer!